When I used comiXology to catch up on the two Transformers ongoing series, I already owned the second volume of More Than Meets The Eye. I wasn’t sure what to expect when I purchased the “digital” version of Transformers: Robots In Disguise Volume 2. How different would it be from getting the individual issues? 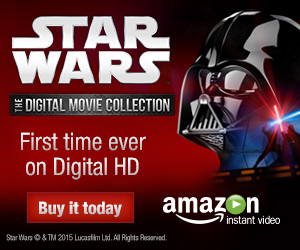 Well, apart from a slight savings in price, the digital trade also includes all of the extras from the regular trade. In this case, these include the trade’s credit page and numerous alternate covers. Compared to MTMTE, there aren’t a lot of fun extras, but this matches with RID’s more serious tone. One advantage of having a trade made out of single issues is that each part has its own introduction and recap, which is helpful for the first story. Much like More Than Meets the Eye, writer John Barber is using his book to tell more than one main story, and in this case, issue #6 tells the first part of “Syndromica.” Published every fourth issue, “Syndromica” follows the former Optimus Prime -- now Orion Pax -- as he, Hardhead, Wheelie, and Wheelie’s alien friend deal with the mad scientist Jhiaxus. IDW’s official marketing strategy is to include as many stories in the ongoings as possible versus putting them in Spotlights or mini-series (which is why All Hail Megatron ends with half a dozen issues of prequel material). I really wish “Syndromica” was its own series so that more could be done with it. This is when RID starts synching up heavily with MTMTE; events in that title reveal intriguing information about Jhiaxus and his student, the cold and calculating Shockwave. While you don’t need to read both, the experience is only complete when the two are read together. In a neat moment, the perpetually-rhyming Wheelie gets so terrified that he forgets to rhyme, which I didn’t even think was possible. Orion Pax also doesn’t believe that Rodimus and his crew are dead, proving him to be as wise as always. Livio Ramondelli (a fellow Penn State graduate, I might add) provides semi-painted artwork for “Syndromica,” contrasting nicely with Andrew Griffith’s artwork for the rest of the issues. As in the previous volume, the main story centers around the three-way political drama between Bumblebee’s Autobots, Starscream’s Decepticons, and Metalhawk’s Neutrals. Issue #7 concerns the return of the Decepticon war criminal Turmoil to Cybertron. Turmoil was a central character in the Drift mini-series, which I didn’t read, but RID sums up what happens well enough. The struggle over what to do with Turmoil and the secret behind his alleged crimes help flesh out Metalhawk’s backstory. At the same time, Wheeljack finds unusual technology aboard Turmoil’s ship that once again ties in to MTMTE. 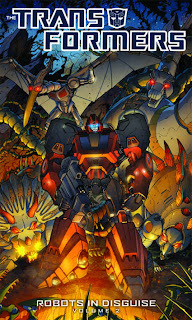 Issues #8 and 9 follow Ironhide and the Dinobots as part of IDW’s “Dinobot Month” promotion. Only four of the Dinobots appear hear; Grimlock was in MTMTE’s Scavengers arc, and his absence weighs on the rest of his team. We do, however, get to see them teamed up once more with Commander Modesty himself, Sky Lynx. If you’re not familiar with the connection, one of the best episodes of the original animated series, “Call of the Primitives,” saw all of the Transformers with animal modes teamed up against Unicron’s creator. The erudite but primal-looking Sky Lynx was -- and still is -- a fantastic foil for the crude Dinobots, and it’s more proof (not that it was required) that John Barber is as big of a Transformers fan as the readers. I’m really happy that Andrew Griffith is the artist on RID and Nick Roche and Alex Milne are the MTMTE art team. If it were the other way around, the books wouldn’t have the right tone. Griffith’s best-drawn character is Prowl, who is constantly plotting in the background. There’s less of an emphasis on him in this volume, but between the two Dinobot issues and “Syndromica,” little could have been done to avoid that. He certainly gets his due in the next volume. I also enjoy how Griffith draws the Neutrals -- they’re much more spindly since they’ve never had to take on forms that can accommodate human passengers. There’s no question that Transformers: Robots in Disguise and More Than Meets the Eye are sister books; it helps that John Barber also edits MTMTE and he and MTMTE writer James Roberts frequently work out their story beats together. With the way that they sometimes double-ship, it sometimes feels like there’s a weekly book instead of two titles. The issues are often self-contained enough to be read as single stories ... but they’re also compelling enough that you want to keep reading once you’ve started. ComiXology helped me catch up on both books without having to wait a long time. It’s even allowed me to skip the Chaos Theory trade from the previous ongoing so that I can just grab the two issues from it that serve as the prequel to the current books. Coming up from Doug next week: Let’s say you’ve just seen G.I. Joe: Retaliation and you want to read some of Larry Hama’s classic run. Where do you go? I’ll show you why the best answer is Classic G.I. Joe. Volume 3.